The sun is setting on 2016, and while it has been another good year personally, this has been one of the worst years I have lived through in terms of international politics and the deterioration in the global political climate. Donald Trump has been nominated by Time magazine as its ‘Man of the Year,’ although this not necessarily an accolade to covet – the same title was once awarded to Hitler, who was illustrated on the front cover in a similar pose. This has been the year Trump and of Brexit, and there is a connection between these populist votes in the United States and the United Kingdom and the rise of the far-right in France, Austria, Hungary and other parts of Europe, and further afield in places such as the Philippines. I was in Britain many times during the run-up to the referendum on British membership of the European Union, and it was disturbing that the murder of Jo Cox did nothing to stem a campaign that had no shame in appealing to racism and xenophobia. The disgusting photograph of Nigel Farage in front of a line of refugees did nothing to shame the ‘Brexit’ campaigners, and the British voters have still to face the reality that the relationship of UKIP to far-right violent movements is parallel to the relationship between Sinn Fein and the IRA. The result of both the US Presidential election and the consequences of the ‘Brexit’ referendum are a challenge for Western concepts of democracy. In the year to come as he takes office, we must remember that as Donald Trump takes office he actually lost the election by a whopping margin of three million votes, and that as Teresa May continues to insist ‘Brexit means Brexit’ nobody actually voted for her as Prime Minister – she was not elected at a general election, and as her opponents faded away as one stabbed the other in the back, there was no actual leadership vote when push came to shove in the Conservative Party. Throughout the year, the refugee crisis has continued in the Mediterranean, and the few heroes to emerge on the international stage in terms of response to this crisis include the crews of Irish naval vessels involved in search and rescue operations in the waters between Italy and Libya, and the NGOs working on the Greek islands and on the streets of Athens. I was inspired, in particular, by the work of Valerie Cox and her family and friends on the Greek islands, and the work of Canon Malcolm Bradshaw of Saint Paul’s Anglican Church in Athens, which is supported by the Anglican mission agency USPG (United Society Partners in the Gospel). Meanwhile, the fighting and killings continue in Aleppo, Mosul, Yemen, and other parts of the Middle East, where the victims are generally not the combatants and the masters of ideology who manipulate them, but civilians, especially women and children. The fake coup in Turkey has emboldened the Erdogan regime in Turkey, adding another destabilising and worrying element to the equation in the Eastern Mediterranean. Sometimes it seems European concerns are awakened only by the violence we have seen cities such as Berlin and Nice. One of the first lessons about terrorists who seek out civilian targets is that there is no political solution to the terror they create. In all this, despite her failed attitudes to the economic crisis in Greece, Angela Merkel stands out as the only European political leader who has spoken with courage and principle about the refugee crisis – she alone occupies the moral high ground in Europe, and she and Jo Cox stand out as the only people who might have been acceptable candidates for the front cover of Time. Nor should we forget that this sort of violence is not always perpetrated by Islamic militants. In Florida, Omar Mateen (29) killed 49 people and wounded 53 others on 12 June in a gay nightclub in Orlando. Was it a terrorist attack or a hate crime? It was the deadliest mass shooting by a single shooter and the deadliest incident of violence against LGBT people in the US. It was also the deadliest terrorist attack in the United States since the 9/11 attacks in 2001. Mateen swore allegiance to but reports have shown he was once a patron of the nightclub and used gay dating websites and apps, and the CIA found no links between him and Islamic State. Nor should we forget either that the largest number of victims of any Islamic-linked violence are Muslims themselves, once we start counting the victims of violence in Yemen, Syria, Iraq and Pakistan, or that the greatest number of refugees and displaced people in the Middle East are being hosted in Middle East countries, including Jordan, Lebanon and Turkey. In the midst of this violence and these humanitarian crises, Europe seems to have forgotten the economic, political and social problems that continue to worsen in Greece and to threaten the fragile stability and very fabric of Greek life. The Olympic Games in Brazil may have been an embarrassment for Ireland when it comes to arrests and allegations of ticket-touting and tickets for events, and intervention of the Sports Minister Shane Ross has failed to caste any bright light on this murky and soiled episode. However, the 2016 Olympic Games in Rio de Janeiro in August 2016 must be remembered in Ireland for the comeback of the men’s field hockey squad after a century-long absence and return to diving after nearly seven decades. But the most memorable performances were by Gary and Paul O’Donovan, who won Ireland’s first-ever medal in rowing, and became internet sensations as the brothers who ‘pulled like a dog,’ and the Laser Radial sailor Annalise Murphy won a silver-medal in the Laser Radial class, ending Ireland’s 36-year medal drought in this sport. For the first time in 12 years, Ireland failed to collect a single medal in boxing, which raises questions about why so much Government funding goes into boxing, and none goes into rowing or sailing. In Rugby, Ireland defeated the All Blacks 40-29, and this is the first time I remember Ireland defeat of New Zealand, Australia (27-24) and South Africa (26-20). The Irish soccer performance at the UEFA ‘Euros’ was also exciting, with the 1-0 victory over Italy at Stade Pierre-Mauro enriched by the behaviour of Irish fans, from both North and South, in France throughout the competition – behaviour that was in sharp contrast to the often racist and violent activities of many English fans. I was involved in working on liturgical material in the Church of Ireland to mark this year’s centenaries of both the Easter Rising in 1916 and the Battle of the Somme in 1916. As a chapter member of Christ Church Cathedral, Dublin, I was vociferous in decrying plans for the Easter 1916 commemorations that threatened to close the cathedral on Easter Day, the most sacred day for Christians and the most important day in the calendar of the Church. Perhaps the 1916 commemorations were marked appropriately and with dignity, remembering all, both combatants and non-combatants, men and women, adults and children. Thankfully, the events were not hijacked politically by Sinn Fein, but waiting will only tell whether there is going to be any political fallout from the way these centenaries were marked. I was invited to speak about 1916 in a number of places, including a public lecture in Saint Mary’s Cathedral, Limerick, being one of the keynote speakers at the Rubicon Conference in Holy Trinity Church, Rathmines, and preaching at the 1916 commemorative services in Christ Church, Taney (Dundrum), and Saint Nahi’s Church, Churchtown, Dublin. I found balance to the commemorative events this year, remembering that 100 years ago in 1916 my grandfather returned from Thessaloniki in Greece with malaria, having taken part in the Gallipoli landings in 1915 and the allied push into Bulgaria the following winter. If the 1916 Proclamation promised that ‘all children of the nation’ would be cherished equally, then the recent occupation of Apollo House showed how this has never been realised in the new Ireland. The protest was never going to solve the housing and homelessness problem, but it has succeeded in drawing attention to the way the state has managed to shore up the banks and financial institutions but has failed families and people on the streets abysmally. I spent Easter in Barcelona, and was deeply moved by the Easter commemorations and celebrations, especially the street processions on Good Friday, and by the architectural heritage of Gaudi, especially in the Basilica of Sagrada Familia. The May bank holiday weekend was spent in Wales, where I stayed in Beaumaris on the coast of Anglesey, and visited the site of the prison camp in Frongoch, where Sergeant Joe Doyle had been a prisoner in 1916, the architectural achievements of Clough Williams-Ellis in Port Meirion, the monastic ruins at Penmon, and Bangor Cathedral. Summer holidays were three weeks back in Rethymnon, on the north coast of Crete, which I have known since the 1980s. I stayed at Julia Apartments in Platanes, just 300 metres from the long sandy beach that stretches for miles east of Rethymnon. There were days at the beaches, islands and lagoons at Gramvousa, Balos, Elafonisi and Panormos, visits to monasteries, churches and cathedrals, a day with friends in Iraklion, and a return visit after many years to Piskopiano and Koutoulafari in the hills above Chersonnisos. But as I hopped around between boats and islands and beaches and lagoons in the Mediterranean waters, I kept being reminded that Syrian refugees were not having the same experiences and the same pleasures just a short distance away. As the year began to come to a close, I spent some time in November in Kraków, where I stayed in Kazimierz in the old Jewish Quarter. I visited the former concentration camps in Auschwitz and Birkenau, and in Kraków I visited at least seven synagogues, a number of Jewish museums, cemeteries and bookshops, the former ghetto, the former Schindler factory, and ate in many kosher restaurants. There were return visits to Lichfield, in March, twice in May, and again in June, with new challenges to read the poetry of Philip Larkin yet again, and there was even some talk about moving back to Lichfield. There were two visits to Tamworth that included a visit to the Comberford chapel in Saint Editha’s and the former Comberford family home at the Moat House. On one sunny, summer Sunday afternoon, I was on my own and spent countless hours walking through the fields and farms of Comberford, photographing the scenery and the buildings. I was lost only in the bliss of the beauty of the countryside, and by the time I realised it was time to organise my return journey to Lichfield in time for dinner I had already walked almost 20 km. There were many visits to London for board meetings of the trustees of the Anglican mission agency USPG, United Society Partners in the Gospel, in February, April, September and November. During those visits, I spent some time enjoying an exhibition on South Bank by Britain’s leading sculptor, Emily Young, who in her teens inspired Pink Floyd’s hit See Emily Paly. During the November meeting, I stayed at the Royal Foundation of Saint Katharine in the East End, and visited Cable Street, the scene of the Battle of Cable Street 80 years ago in 1936, and some of the churches associated with the Anglo-Catholic slum priests of the East End. This year, the USPG conference took place in Swanwick, which I had first stayed in 40 years ago in 1976. Here I was able to meet up again with Canon Malcolm Bradshaw from Athens, and there was palpable joy at the conference when the decision was taken to return to using the familiar and well-loved initials USPG. Once again, I spent study leave this year in Cambridge in August and September, taking part in the annual conference of summer school at Sidney Sussex College organised by the Institute for Orthodox Christian Studies. I stayed the weekend before in in Clare College before moving on to Sidney Sussex for the summer school, and each morning attended church in Saint Bene’t’s. The week also included a day’s retreat in the Monastery of Saint John the Baptist in Tolleshunt Knights, Essex. In Ireland, there were return visits to Wexford and Bunclody, and to Ballybur Castle between Kilkenny and Callan, and I stayed at different times in the Maritime Hotel in Bantry, Co Cork, the Newpark Hotel in Kilkenny, the Ferrycarrig Hotel in Wexford, the Dunraven Arms Hotel in Adare, Co Limerick, and the Maritime Hotel in Bantry, Co Cork. 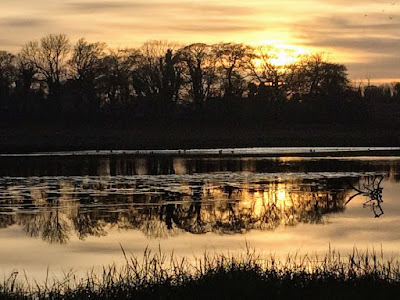 I took part in the Dublin and Glendalough Diocesan Synod meetings in Athy, Co Kildare, and Greystones, Co Wicklow, the clergy conference in Kilkenny, and a retreat on Ash Wednesday in Saint Patrick’s College, Maynooth. There were walks on the beaches in Cushendun, Co Antrim, Annagassan, Co Louth, Bettystown and Laytown, Co Meath, Skerries, Rush, Loughshinny, Portrane, Donabate, Malahide, Portmarnock, Sandymount and Blackrock, Co Dublin, Bray, Greystones, Kilcoole, Wicklow and Silver Strand, Co Wicklow, Ballyomoney and Courtown, Co Wexford, Schull, Altar and Barley Cove in Co Cork, and the beaches in Barcelona, Crete and Anglesey, as well as walks by the coast at Dunluce, the Giant’s Causeway and Carrick-a-Rede in Co Antrim, in Carlingford, Howth, Dalkey, Killiney, Dun Laoghaire, and Mizen Head. I was invited to a return visit to Gormanston Castle, at my old school outside Drogheda. The school is facing up to a new mode of existence that offers challenges and opportunities. It is still sad, though, the Franciscan friars are leaving Gormanston Castle, and that the Augustinian friars too are leaving Orlagh. I took part in the Darkness into Light walk in Marlay Park in May and there were walks in the Phoenix Park, the grounds of Farmleigh House, and Marlay Park, and country walks in Bohernabreena, Co Dublin, Maynooth, Castledermot, Johnstown and Naas in Co Kildare, and in Antrim, Cork, Kerry, Kildare, Kilkenny, Limerick, Louth, Meath, Wicklow and Wexford. In England, there were country walks in Staffordshire, Essex, Derbyshire, and outside Cambridge. There were river-side walks by the Liffey in Lucan and in Dublin, the Dodder in Firhouse, Rathfarnham, Rathgar, Churchtown and Ballsbridge, the Nanny in Julianstown and Laytown, the Slaney in Bunclody, Enniscorthy and Wexford, the Nore in Kilkenny, the King’s River in Kells, the Barrow in Carlow, the Boyne in Trim, the Shannon in Foynes, Limerick, Killaloe and between Longford and Roscommon at Tarmonbarry, the Maigue in Adare and the Deel in Askeaton, the Tame in Tamworth, the Thames in London, and the Backs and the River Cam in Cambridge, canal-side walks by the Grand Canal in Portobello and at Baggot Street, by the Royal Canal in Castleknock, and lake-side walks in Virginia, Co Cavan, and by Stowe Pool and Minster Pool in Lichfield. For the first time, I visited the Powerscourt Demesne near Enniskerry, Co Wicklow, the Dark Hedges in Co Antrim, the Carrick-a-Rede Rope Bridge in Co Antrim, Sion House and Sion Mills in Co Tyrone, Bellingham Castle, Co Louth, Trim Castle, Co Meath, and the Bluebell Forest near Rathangan, Co Kildare. I quickly fulfilled a New Year’s resolution to do something new at least once a month. In June, I went sailing in Dublin Bay, from Sir John Rogerson’s Quay in Dublin to Dun Laoghaire, and from Dun Laoghaire to Howth. Although there were fewer opportunities to watch some rowing, apart from Carlow, Cambridge, Bray and Skerries, there were a few boat trips in Crete, and there was a little more time for cricket last summer. There were family weddings in Ballmagarvey, Co Meath, Lisnavagh House, Co Carlow, and Macreddin Village near Aughrim, Co Wicklow, and there were funerals too, including my former colleague on the Foreign Desk of The Irish Times, Declan Burke-Kennedy. I continue to teach on the MTh course at CITI. I have been an external examiner this year for Saint Patrick’s College, Maynooth, on the MTh in church history and on the certificate-level course in theology. But after five years, my lecturing at Mater Dei on the BA, BEd and BTh courses has come to an end as the Mater Dei Institute for Education moves to Dublin City University. My contributions to new books include two chapters in Death and the Irish, A miscellany edited by my friend and colleague, Dr Salvador Ryan, Professor of Ecclesiastical History in the Faculty of Theology at Saint Patrick's College, Maynooth, and published by Wordwell. My contributions tell the story of the Revd Henry Francis Lyte, the former curate of Taghmon, Co Wexford, who wrote the hymn ‘Abide With Me,’ and the stories of two Irish people, JJ Murphy from Cork and Richard Bourke, 6th Earl of Mayo, who died in Italy and in India, and whose bodies had to be shipped back to Ireland in unusual conditions – one in an upright piano for burial in Co Cork and one in a barrel of rum for burial in Co Kildare. My photograph of a sculpted head of Brian Boru features in Tara, The Guidebook, a new book on Tara by Mairéad Carew and published by the Discovery Programme. My contributions to the annual report of the Friends of Lichfield Cathedral this year included papers on the composers Frederick Oakeley and John Alcock, who both lived in Lichfield, and it was a pleasure to be cited in Joss Knibb’s new book, Lichfield in 50 Buildings. I addressed the National Famine Commemoration in Glasnevin Cemetery, sharing a platform with President Michael D Higgins, spoke at meetings of Affirming Catholicism, and once again spoke at the annual Hiroshima Day commemorations in Merrion Square, Dublin, as President of the Irish Campaign for Nuclear Disarmament (CND), and there were radio and television interviews with RTÉ and local stations. I continue to write my monthly column for the Church Review (Dublin and Glendalough) and the Diocesan Magazine (Cashel, Ferns and Ossory), also writing occasionally for Search, on Orthodox Spirituality, for Koinonia on Samuel Johnson and on the 500th anniversary of Luther nailing his theses to the door of the Church in Wittenberg, and or Reality on Anglican understandings of the Eucharist. I also continue to write for the Church of Ireland Gazette and The Irish Times. I was at ordinations in Saint Columb’s Cathedral, Derry, Saint Gobhan’s Church, Seagoe, Portadown, Saint Anne’s Cathedral, Belfast, and Christ Church Cathedral, Dublin, the installation of a new dean in Saint Patrick’s Cathedral, Dublin, and of new prebendaries in Saint Mary’s Cathedral, Limerick, and the institutions of new rectors, including Belturbet, Co Cavan, Enniscorthy, Co Wexford, and Drumcondra and North Strand in Dublin. I preached and presided at the Eucharist throughout the year in the Chapel of the Church of Ireland Theological Institute, Dublin, in Christ Church Cathedral, Dublin, Saint Bartholomew’s Church, Ballsbridge, Saint John the Evangelist, Sandymount, and I also preached in Saint Flannan’s Cathedral, Killaloe, Co Clare, Christ Church Taney, Saint Nahi’s Church, Dundrum, Saint Brigid’s Church, Stillorgan, All Saints’ Church, Blackrock, and Christ Church, Delgany, Co Wicklow. There were graduations in Trinity College Dublin, and committee meetings too, and there was joy too when the external examiner from Cambridge recommended the publication of a student’s dissertation I had supervised. I was invited twice to join the Choir of Christ Church Cathedral for a speaking part that made use of my bass voice, and I also visited Saint Mel’s Cathedral, Longford, to see the restoration work and the new Baptismal font and Stations of the Cross installed after a fire some years ago. This year, my online Lenten reflections drew on the work of Samuel Johnson, and I led a Lenten retreat for Lay Readers on the themes of Saint Patrick and Celtic Spirituality. My Sarcoidosis and my B12 deficiency, with worrying growths and skin patches on my skull and my nose led to a new round of holiday tests in the Hermitage, Lucan, and Tallaght Hospital. But once again I have received an ‘all clear’ and my walks on beaches, by rivers and lakes and in the countryside boost of my feelings of wellbeing. As I say so often, I may have sarcoidosis, but sarcoidosis does not have me. There are new and exciting moves in 2017 as I prepare to move into the Rectory in Askeaton, Co Limerick as Priest-in-Charge of the Rathkeale and Kilnaughtin Group of Parishes, which includes four churches: Holy Trinity, Rathkeale, Saint Mary’s, Askeaton, and Kilcornan (Castletown, Pallaskenry), Co Limerick, and Saint Brendan’s, Kilnaughtin (Tarbert), Co Kerry. As the New Year unfolds there are exciting new opportunities to take up in the Diocese of Limerick and Killaloe. I have often said that when my coffin is carried into church for my funeral – hopefully later than sooner – that I expect to hear his If it be your will, and as it is carried out I want to hear Dance me to the end of love. When it comes to facing my own death in the future, I hope I face God with the same resignation and trust he shows in the title track of his final album, You Want It Darker. If 2017 brings us deeper into the ‘Post-Truth’ era, we need to name it for what it is: ‘Post-Truth’ is an Orwellian world filled with lies, disinformation and misinformation, where we are instructed to ignore facts, dismiss the experts and live by standards that even Goebbels never managed to impose. 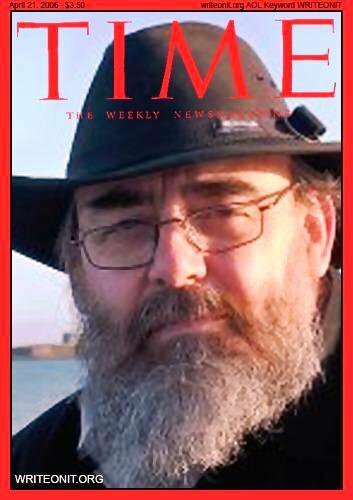 Yes, of course, Time could have chosen a better Face of 2016 instead of Donald Trump. But for me, the faces of 2016 are the faces of Auschwitz, the faces that lined the corridors of the prison blocks in the concentration camp, black and white photographs of mothers, sons, daughters, sisters, brothers, fathers, friends, lovers, strangers, work colleagues … Jews, gypsies, gays, priests, communists, professors, workers, Poles, Slavs … tiny children and babies. Many were anonymous, their names forgotten because those they knew and loved had died too. But they should never be forgotten. They looked so like the people I know and the people who know me, the people I love and the people who love me. If we forget them, then we forgot how extremism plants its cancerous and deadly roots, using the unsuspecting, who become the unquestioning, and then become complicit, first passively and then actively. Join me this week as I visit these four buildings, all within walking distance of each other. My final visit this week is to the former Kildare Street Club, on the corner of Kildare Street and Leinster Street, on the south side of Trinity College Dublin. The Kildare Street Club was founded in 1782, at the height of Grattan’s Parliament in Dublin. The club’s first home was a house in Kildare Street built by Sir Henry Cavendish on land bought from James FitzGerald, 20th Earl of Kildare, later 1st Duke of Leinster. In 1786, the club expanded its premises acquired an adjoining house also built by Cavendish, and completing its original club house. The club was formed after William Burton Conyngham was black-balled at Daly’s Club in Dame Street, which stood on the present site of the Central Bank. Many members left Daly’s, and the new club soon became more fashionable. Many of the earliest members, including Sir Jonah Barrington, opposed the Act of Union. In a famous incident in 1806, Francis Mathew, 2nd Earl Landaff, a supporter of Catholic Emancipation, denounced the 85 scoundrels who had blackballed his brother, Montague James Mathew, and stalked out of the club, never to return. By 1840, the club had 650 members, ‘a large and elegant card-room, coffee, reading, and billiard-rooms.’ The original premises at 6 Kildare Street soon became too small for the members’ needs, and in 1858 it was decided to build a new club house. In 1859-1860, the new club house was built, designed by Thomas Newenham Deane and Benjamin Woodward. The new building replaced three existing houses on Kildare Street and one on Leinster Street, which were demolished, giving an L-shaped new building, with an internal plan similar to that of the Reform Club in Pall Mall, London. The club had planned to move from the old to the new building in 1861, but on 11 November 1860 there was a disastrous fire at the old club house. Three maids died, and a fourth was saved because at the time she was in the bedroom of the club accountant and she was rescued. All the club pictures and furniture and a library of 15,000 books were destroyed, and the club moved into the new building before it was completed. Woodward was commissioned to design new premises, but died in Lyons in France before the new building was completed. The project was then taken over by his partner Deane, who also designed the National Library and the National Museum further along Kildare Street. The contractor was Gilbert Cockburn, who worked with Deane and Woodward on many of their buildings. Work began in February 1859, the club was built to first floor level by that November, and it opened in November 1861. The building costs came to more than £25,000. Deane and Woodward designed the Kildare Street Club in the Italian Gothic style, following the principles set out almost a decade earlier by John Ruskin. However, the club committee altered their original Italian Gothic design, insisting on large arched windows divided by thin columns, and the outcome was later described as Italo-Byzantine. In their designs, Deane and Woodward were following the London fashion of drawing on Italian palazzi for inspiration for gentlemen’s clubs. In 1860, The Building News pointed to Pall Mall, where the Reform Club House was based on the Palazzo Farnese in Rome, the Travellers’ Club on the Pandolfini Casa d’Este in Florence, the Carlton on Sansoviuo’s Library of Saint Mark in Venice, while the Army and Navy Club was inspired by a palazzo on the Grand Canal in Venice. It building is built mainly of red brick, with stone cornice, strings, and columns. The simple façade is broken only on the ground story by the projection of the balconied portico. The columns of this ripple-arched portico are executed in green and red marbles alternately, and the capitals are carved elaborately. On the Leinster Street side, there is a handsome, two-storey, canted bay window. The window openings segment-headed, single on the Leinster Street side and on the Kildare Street side paired on the ground floor, paired and tripled on the piano nobile and single on the attic storey. The interior was described as one of the finest interiors of 19th century Dublin, with its entrance hall, grand stair hall and reception rooms. A notable feature of the building is the extravagant external sculpture and carvings around the window columns, with rich foliage, birds, mice, a greyhound chasing a hare, and monkeys playing billiards. The monkeys playing billiards are a particular favourite: one is lining up his cue with the ball on the table, another is chalking his cue, while a third is watching on. These carvings were badly damaged some years ago during an over-zealous cleaning of the façade. For many decades, architectural circles have debated who were the sculptors of the external mullions, the playful monkeys and other animals. The three main candidates are the O’Shea brothers, Charles W Harrison and Charles William Purdy of Purdy and Outhwaite. The O’Shea brothers were also responsible for the carvings in the Oxford Museum as well as at the nearby Museum in Trinity College Dublin, which we visited on Wednesday [28 December 2016]. James and John O’Shea were the sons of a stone carver from Ballyhooley, Co Cork, who may have been a member of a family from Callan, Co Kilkenny. They worked for Deane and Woodward on the museum at Trinity College, Dublin (1853-1857) and with Edward Whelan they worked on the University Museum, Oxford (1854-1861). At Oxford, it is said, some of their work was removed in the fallout from Darwin’s publication of the Origin of the Species. The O’Sheas had carved monkeys on one of the window surrounds that was removed because some Oxford dons could not accept that man was related to monkeys in any way. After finishing their work at the Oxford Museum, all three carried out other commissions in England, but the O'Shea brothers may have returned to Dublin to work on the carvings on the Kildare Street Club in 1859. And so, it is said, the O’Shea brothers kept their monkeys at the Kildare Street Club. According to local tradition in Callan, James and John O’Shea returned to Callan, and James O’Shea and his son Edward O’Shea were active in Callan from the late 1860s until the early 1880s. Edward O’Shea (1853-1910) later carried on the business in Kilkenny, and he was the Mayor of Kilkenny from 1904 to 1906. On the other hand, Harrison did the carvings of snakes, snails and butterflies on the staircase, but many of the external and internal carvings were the work of Purdy and Outhwaite, Dublin-based architectural sculptors. Charles William Purdy and John Henry Outhwaite came from England to Dublin and set up in business at 206 Great Brunswick Street around 1859 or 1860. The firm moved to Westland Row later in 1860, but their successes the business went bankrupt in June 1861. Purdy may have then moved to Belfast, while Outhwaite seems to have found work with another employer and is credited with executing the ‘exquisite’ font in Henry Hill’s church of Saint Edmund (Church of Ireland) in Coolkenure, Co Cork (1865). The rival Saint Stephen’s Green Club was associated with Parnell’s Irish Parliamentary Party, while the Kildare Street Club was seen as Conservative and Unionist. After partition in 1921, and again after World War II, the Kildare Street Club found itself in decline. The building was divided around 1954, and on 4 May 1967 a fire swept through the top floor of No 1 Kildare Street. causing extensive damage. Planning permission was refused for its demolition that year, but with a decline in membership the club decided in 1976 to merge with the University Club at 17 Saint Stephen’s Green as the Kildare Street and University Club and moved out. The building was divided up in 1971 so that little remains of the once-elegant interiors. In what Christine Casey calls ‘the most singular act of architectural vandalism in recent Dublin history,’ Woodward’s fine staircase with its stone balustrades, the hall with its fine vaulted arcades, the drawing room, and the morning room were all destroyed and office space inserted into the building. The former club house of Kildare Street Club is now leased to the Heraldic Museum and Genealogical Office, the Manuscripts Reading Room of the National Library, and the Alliance Française. The main exhibition space of the Heraldic Museum demonstrates the scale and grandeur of the original interiors, while a hint of what may have been can be found by visiting the ‘Byzantine’ interior of the Museum Building in Trinity College Dublin. As for those monkeys, and their supposed Darwinian associations, the Heraldic Museum and the club’s location on Kildare Street, close to Leinster House, may provide an alternative narrative. The coat of arms of the Dukes of Leinster derives from the legend that John FitzGerald, 1st Earl of Kildare, as a baby in Woodstock Castle, was trapped in a fire when a pet monkey rescued him. 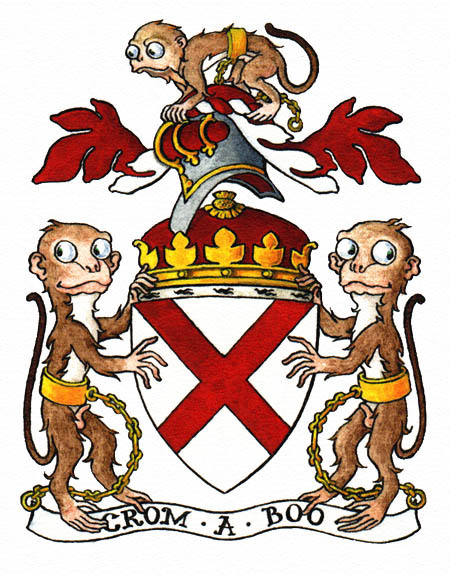 The FitzGeralds then adopted a monkey as the crest on their coat of arms, and later as heraldic supporters, and they occasionally used the additional motto Non immemor beneficii (‘Not forgetful of a helping hand’). We have reached the end of the month, the end of an old year, and New Year’s Eve. Tomorrow is New Year’s Day and the Christmas season continues. Each morning throughout the Twelve Days of Christmas, I am using the prayer diary of the Anglican mission agency, USPG (United Society Partners in the Gospel), for my morning prayers and reflections. Give thanks for the work of the Anglican Church in the Holy Land as it reaches out to people of all faiths and from all walks of life. I John 2: 18-21; Psalm 96: 1, 11-13; John 1: 1-18.